Secure labels dual layer (ταινίες κλειδώματος ετικετών) είναι ασφαλείς, οι πιο απλές και αποτελεσματικές σφραγίδες για τη στερέωση κιβωτίων, συσκευασιών, οργάνων μέτρησης και ελέγχου, οχημάτων, αεροσκαφών, φορητών υπολογιστών κλπ. 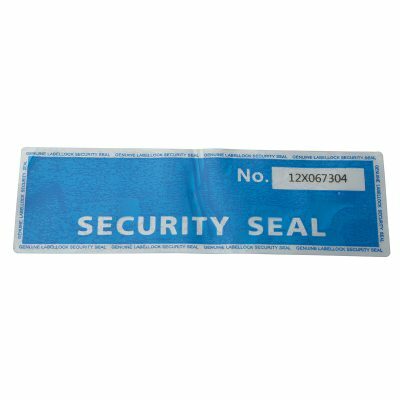 Secure labels dual layer are simple and effective seals to secure the boxes, packages, doors, tanks, etc. Designed and produced to restrained and to highlight any attempted violation of these “seals”, they will show a clear message “OPENED” on both the label and the surface if they are removed. Each tag is unique in series – under the label area – to prevent fraudulent substitution (deletion, substitution) and to allow the recording in a database. Message violation is done in a secure format. The label is made “in-register” that is, each label is designed in an unique format. The dual layer security labels are made from a semi-transparent material so a new label can not be pasted over the old warning message “OPENED”. Label Layer Dual Lock ™ is also available in transparent to visible UV violation message. Labels are available in three standard variants. Secure Labels Dual Layer can be personalized according to customer requirements – the warning message, logo, color, mode of insertion. Series are in a standard format “encrypted” and this allows multiple tests: batch, production date, the person responsible. Series are stored both in the database of manufacturers (UK) and in our database over a long period (7 years), according to UK rules of evidence of special products. Bank Seals Envelopes Labels (Стикери Етикети Пликове за сигурност, Banke brtve Sigurnosne torbe Naljepnice, Τραπεζικές Φάκελοι Ετικέτες ασφαλείας, Bank Plombak Biztonsági tasakok Biztonsági szalagok és címkék, Sigilli bancarii adesivi etichete buste e sacchetti di sicurezza, Bankplomben / Umschläge / Etiketten) are sealing elements and security products used in areas requiring a high degree of security. It is used mainly in banking, cash in transit, and courier delivery. You get a sealing solution to provide an audit trail of seal scans controlling the steps along the route, securing ATM cassettes or evident interfere with protection of security bags, envelopes and security boxes.